IntroductionPrism is a set of libraries that allow developers to compose applications from separate components into a composite application. Prism is a set of libraries that allow developers to compose applications from separate components into a composite application. Composite meaning that the application functionality is split up into different modules that do not necessarily know about each other and then brought together to create an application. They allow modules to be individually developed, tested, and deployed by different individuals or sub-teams; they also allow them to be modified or extended with new functionality more easily, thereby allowing the application to be more easily extended and maintained. Note that even single-person projects experience benefits in creating more testable and maintainable applications using the composite approach. They provide a common shell composed of UI components contributed from various modules that interact in a loosely coupled way. This reduces the contention that arises from multiple developers adding new functionality to the UI, and it promotes a common appearance. They promote re-use and a clean separation of concerns between the application’s horizontal capabilities, such as logging and authentication, and the vertical capabilities, such as business functionality that is specific to your application. I am going to assume that you know how to create an application solution, reference libraries and create class libraries in Visual Studio so I am not going to explain those details in depth. If you do not, you should study those items first. The first thing to do is to fire up Visual Studio 2008. Then create a new WPF application and name it whatever you want. For the purpose of this article I will name my solution “PrismArticle”. This is going to be the “shell” for our application. The shell is just a container to display the primary user interface. The shell can contain one of more views that are displayed to the user. Note that some of the code presented is more or less boilerplate code and copied from the Prism documentation. In the solution explorer, rename Window1.xaml to Shell.xaml. Open Shell.xaml and change the Title attribute to “PrismArticle” or whatever you want. Add a new class to your project named Bootstrapper.cs. Add these using statements to the top of the Bootstrapper file. Change the Bootstrapper class to inherit from the UnityBootstrapper class. Override the CreateShell method in the Bootstrapper class. Open the App.xaml.cs and override the Startup event. Open the App.xaml file and remove the StartupUri since we are manually starting up the window in the bootstrapper. What the heck did we just do? Everything up to step 8 should be pretty much self explanatory except for step 5. Step 5 is where we setup a ContentControl in the shell window and named it “MainRegion”. Prism uses a concept called a Region that defines an area where a view is going to be displayed. If we had a module that mapped itself to the MainRegion, then that view would appear in that region. We will be doing just that in the next section. Step 9 is where the application main window is created and shown. Step 10 is where a catalog of the modules that the application uses is created. There are several different ways to accomplish this but for our example we are going to use a ConfigurationModuleCatalog which reads a configuration file and loads the modules defined in that file. Step 11 is where the application starts up and instantiates the Bootstrapper. Before we create our first module we need to do a bit of configuration. Remember that we wanted to load our modules at runtime. To do that we have to have a place for the modules to be. So, in the solution folder create a “bin” folder, and then inside that folder create a “modules” folder. The bin folder is where we will put the executable and the modules folder is where the modules are going to go. Open up the project properties and on the Build tab set the output path to the bin folder that we just created. Now for our first module. One thing that I deviate from the Prism documentation is that the Prism docs describe creating the regions to show the views in the shell. What I am going to do is to create a module that is shown in the main window and defines the regions for the application. This way the shell application remains static and the modules define the application. So our first module is the view that is going to be shown in the MainRegion that we defined before. Add a Class Library project to the solution. For the sake of this example, I named my module project “MainWindowModule”. Open the Project properties select the Build tab and then change the output path to the modules folder under the bin folder that we created earlier. Add a private variable to the class named _regionManager of type IRegionManager. The RegionManager allows us to access the regions defined in the application. Add a constructor to the class that accepts an IRegionManager parameter. Inside the constructor, make the _regionManager equal to the IRegionManager passed in. Now we need a MainWindowView to show in the MainRegion. Just to make things a bit tidy, add a new folder to our solution named “Views”. Inside the Views folder, add a new WPF user control named MainWindowView. To make everyone happy, you have to add another using statement to include the Views now. The Modules section defines what module to load and where to load it from. The “assemblyFile” attribute defines from where to load the module from. In this case we are loading the module from the Modules folder. The “moduleType” attribute is the name of the class that we want to load. The Prism docs call this a “type” which might be misleading for a beginner. This is the namespace and name of the class that implements the IModule interface. The last attribute simply defines the module name. There are other attributes that I will leave for another time. This is sufficient to get us going. Now if you run the application you show at least get a stop at the break point you set earlier. But, chances are that you will see a blank window. Unless you open up the MainWindowView XAML file and put something in the window you won’t see anything. Go ahead and experiment and when you are finished playing around we will go on to the next phase. 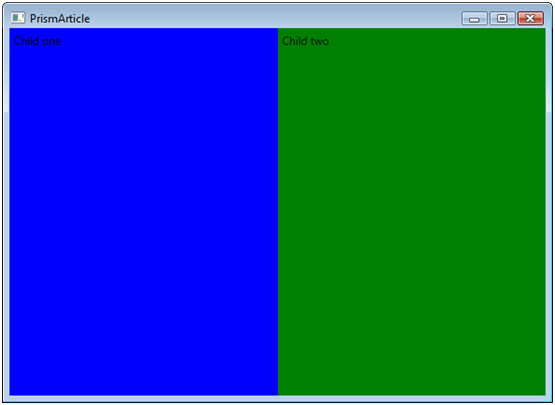 Now that we know how to create and load a module the next thing that we want to do is to create a couple of child windows that we will display in the MainWindowView. We are not going to do anything fancy. Adding child views to the MainWindow is relatively painless. It’s basically the same as what we did for the MainWindowModule expect that the regions that we are going to define are in the MainWindowView. So, open up the MainWindowView XAML file and delete any content that you might have put there to experiment with. If you did do any experimenting you might have noticed that the contents of the MainWindowView were confined to a specific size when you resized the window. This is because of the Width and Height attributes in the view being set to 300. Go ahead and delete those two settings so that the view will fill the parent window. Add 2 more class libraries to the solution; name one “ChildOneModule” and the other “ChildTwoModule”. The setup for these modules pretty much mimics the steps we followed to create the MainWindowView. The code for both is about the same except for the region names. Here is what I did. Feel free to experiment. The ChildOneView I simply changed the background color and added a label to identify the view. I did the same to the ChildTwoView except I made the color different. 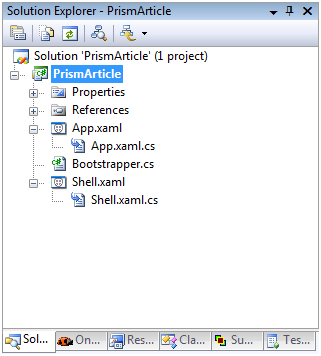 Remember to add the Prism libraries to the module projects. Remember to add the module definitions to the app.config file. Note that the order in which the modules are listed matters! If you list the child modules after the MainWindowModule , Prism will throw an exception saying that the RegionManager does not contain the <name of region> region. After running around in circles for about 2 hours, you will discover that the modules appear to be loaded from the bottom up. So the MainWindowView has to get initialized first so the other views have a region to get loaded into. The final application will look like this when it’s all said and done. There we have downloaded and complied the Prism Library. Created a project that created a shell window using Prism, added a module to serve as the main window view and then finally added two more modules that served as two child views and loaded into the application dynamically loaded at runtime. This allows the UI views for the application to be developed separately from each other and to be totally independent code. Hopefully this is just the beginning of an exploration of the Prism framework. Depending on my work load and motivation I may continue writing about this. Next I think that I will explore getting our two child views to communication with each without them having to know anything about each other. Here are links to the code for this article. Rename the archive from .doc to .zip before opening, this is a wordpress requirement. The code is presented as is with no warranty implied or guaranteed. First off. Great explanation. This was the only clear example of configuring Prism via app.config I could find, so thanks!! ...this meant that the order of the module names had to be reversed again (i.e. Main module first!!!?!). I thought I was going mad but if this helps someone else my insanity was not in vain! Never argue with an idiot. They will drag you down to their level where they are an expert. I saw these first easy steps repeated over and over on many blogs, articles or tutorials (written or video). Unfortunately, at least for me, getting past the Hello Worls type of apps with Prism is painfull and resources for real world scenarios are few and far between. For example imagine an application that presents the user with a login page and if the credentials are good (data access is done with RIA Services), then the Silverlight app must display a new page with some edit controls. How would you handle the navigation from the login screen and the second page (and back again after logging off)? Trust me, I feel your pain. I went through that very same thing. Once I got the hang of it, it became way less painful. For your simple example there are many possibilities but I will try and keep it simple, because that is me, simple. The first thing is that from your description we will have one window with two seperate views; a login view and some sort of data entry view. When your app starts up, you would have the RegionManager add both views to the region. A region can contain multiple views but only one view can be active at one time. Your login view could have a Command attached to your login button. When you click the button, then you would perform your credential validation by whatever means you want. If the validation is successful, then you would have your RegionManager set your data entry view to be active using the RegionManager.Region[RegionName].Activate(View) method. Which would hide the login view and show the data entry view. When your user logs out then you would simply have your RegionManager hide the data entry view and activate the login view again. Thanks, it sure helps. Your suggestion was a big step in the right directon, but I still haven't reach the line. Specifically what I've done so far was the authentication logic in the LoginPageViewModel and I also managed to raise an event from there (with IEventAggregator) and subscribe to it in the DataEntryPageViewModel. So far, for testing, it's just showing a message box. The thing I'm trying to wrap my head around at the moment is how to access the global RegionManager from the DataEntryPageViewModel (from the handler of the event I subscribed to) in order to Activate/Deactivate views (I need references to the region and the view involved, which I'm not sure how I should obtain in the View Model class). Please forgive me for asking for direct help here... It's no problem if you don't answer. But if you do, I'll be very grateful. The rest of your problem depends greatly on how your app is structured. What I do is to have the RegionManager passed to the viewmodel in the constructor and let the container figure it out. I assume that is how you got the eventaggregator, it's the same thing. If for some reason you can't get the reference that way, there is is a nifty class in Prism called the ServiceLocator that will let you get a reference to the services. So you would say something like ServiceLocator.Current.GetInstance<iregionmanager>(), and that would return a reference to the region manager. Which gets the view from the region manager based on the name and then activates it. For the moment I managed to do it, but I'm not very pleased. I tried to do add the view with a name, like below, but I don't know how to call the constructor of the ViewModel class (which needs an IRegionManager and IEventAggregator). So the problem what the parameters should be. If I put null for both, it will obviously throw an exception. Try adding RegionManager and EventAggregator parameters to the constructor of your login page view model and see if the container will fill those in for you. When the container instantiates your viewmodel class, it should pass the instances of the regionamanger and eventaggregator through the constructor. Actually it's not misleading at all. But apparently uni-voters use any excuse to knock someone else's work.